Remove IQIYI Video with just one click! IQIYI Remover completely deletes IQIYI on the hard drive and in Windows registry. IQIYI software is difficult in removing using internal Windows uninstaller. IQIYI Remover fixes this problem. Remove IQIYI Video with just one click! IQIYI Remover completely deletes IQIYI on the hard drive and in Windows registry. IQIYI software is difficult in removing using internal Windows uninstaller. IQIYI Remover fixes this problem. It kills IQIYI processes, deletes IQIYI created files and the registry keys. IQIYI Remover is aware of adware or spyware components. 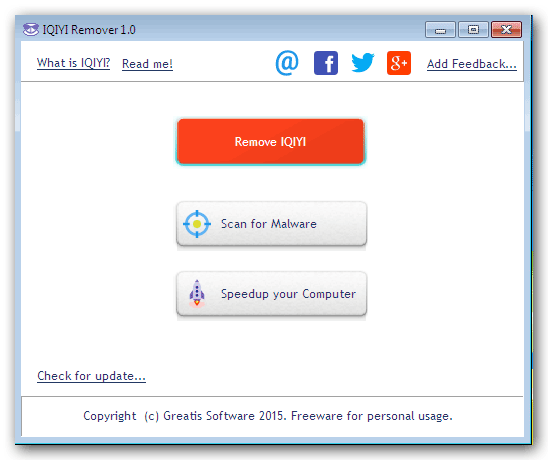 IQIYI Remover is compatible with all known antiviral software. Comodo AntiSpam Desktop 2005 is an intuitive, easy-to-use, client-based software product that eliminates spam forever from the computer\'s email system. No license fees - No charges - No more Junk Mail!! Just register and install. Bayesian spam filtering plug-in for Outlook Express stops over 98% of spam. Supports your Address Book. Allow/Block List. Backup and Restore. Bounces email back to spammers. Reports spammers to their ISPs. Auto-deletes spam emails. Statistics.